The following pages contains many words of praise of Pizmonim by our Hakhamim of the past. Image below, a summary chart of the entire "Shir Ushbaha Hallel VeZimrah" Red pizmonim Book is reproduced from "Let Jasmine Rain Down" by Kay Kaufman Shalamay. 6000 I2 Shir Ushbaha Hallel VeZimrah Published in Jerusalem in 1964 for the Aleppo Jewish community of Brooklyn, New York. 6001 I3 Zemirot Yisrael Title Page of "Zemirot Yisrael," By H Israel Najara, Safed, circa 1600. 6002 I4 Attiah Manuscript Yehuda Attiah pizmonim manuscript of Aleppo, 1858. Courtesy of his descendent, Sofer Alberto Attia. 6003 I5 Miqra Qodesh Miqra Qodesh Baqashot book of 1873. Composed in Aleppo, by H Mordekhai Abadi, Eliahou Hamaoui and Eliahou Dahab. 6004 I6 Baqashot of Shabbat Baqashot book from Beirut, 1913. 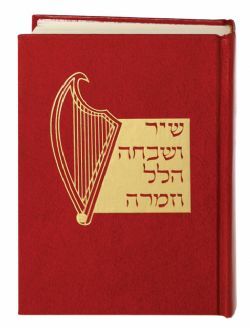 6005 I7 Shir Ushbaha Composed by H Raphael Haim Cohen and published in Jerusalem in 1921. Includes the compositions of H Raphael Antebi Tabbush. 6006 I8 Miqra Qodesh Baqashot book from the Syrian community of Cairo, Egypt in the 1930s. Published by Obadia Antar, Abraham S Shehebar, and Yosef A Ashkenazie. 6007 I9 Shirei Zimrah Haim Shaul Aboud. Used in Israel in the 1950's and 1960's. 6008 I10 Baqashot of Shabbat Baqashot title page of Haim Shaul Aboud's book. 6009 I11 Gate of the Song The following is a chapter from H Abraham Antebi's "Ohel Yesharim," 1820, which deals with pizmonim. 6010 I13 Introducion to Shir Ushbaha Introduction to "Shir Ushbaha" by H Raphael H Cohen. 6019 xiii H Moshe Ashear Introduction Introduction of "Hallel VeZimrah," by H Moshe Ashear. Reprinted in SUHV pizmonim book. 6022 xviii Pizmonim Committee These people were in charge of selecting which pizmonim to include in the SUHV publication. Circa 1959.